Family-run for over a century, this historic 4-star hotel next to the Votive Church and a small park is just steps away from the Ringstraße boulevard and the University of Vienna. Entirely non-smoking, Hotel Regina offers free Wi-Fi and includes a restaurant. At the restaurant Roth, guests can enjoy Austrian and international cuisine, Viennese specialities, and fine Austrian wines. The Regina Hotel's elegant, soundproof rooms offer cable TV, a seating area, a minibar, and a bathroom. 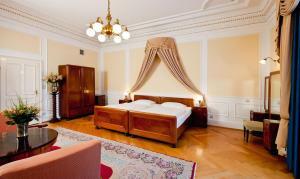 They are decorated with elegant Italian or original Art Nouveau furniture. The Schottentor Underground Station is only a 2-minute walk away and provides connections to all attractions in Vienna.